The overarching trend seemed to be raised hems at the front, but not so much as we've seen in previous years - the cut has dropped considerably to ankle length, which gives the advantage of showing off fabulous shoes! There were lots of sequins too, which always pleases me - because awards shows are basically an excuse for a big party, and you can't have a party without sequins - and glamorous plunging necklines. I also really liked the fact that lots of the dresses were very simple, with the focus on gorgeous shapes and block colours, and natural hair and make-up to offset the whole look. Once again it took me a long time to narrow down my favourites, but eventually I got to my top ten dresses (plus one bloke). So without further ado, here are my picks - did you like any of these? Channelling her American Hustle look, Amy Adams' down-to-there halterneck dress in two shades of red looks amazing on her. Again she's letting the dress do all the talking by sticking to a really simple cut, a classic top knot and barely-there natural make-up. One of my favourites. For younger Hollywood stars, there's often a fine line between looking too old and too young on the red carpet. But Ariel Winter nails it here; this berry-coloured dress is lovely against her skin tone, but by keeping her hair natural and going for a simple flicky eye she doesn't look too 'done'. The overall look is glamorous yet still youthful, and I'm looking forward to seeing what she wears next. There was a bit of a mini-trend for red carpet workwear at the Golden Globes (see also: Julia Roberts in Dolce and Gabbana) but Emma Watson carried it off brilliantly. The slim-fit trousers and stiletto heels give it a rocky edge that contrast with her demure low bun and toned-down smoky eye, and the half-dress (for want of a better thing to call it) looks great over the top. Kudos to her for doing something different! Another mini-trend: very stylish pregnant ladies. I loved Kerry Washington's Balenciaga and Alexander Wang not-quite-a-trouser-suit and Olivia Wilde's slinky green sheath, but my top pick was Drew Barrymore's beautiful floaty floral Monique Lhullier dress. I love the texture of the petals - it makes me want to reach out and touch it - and the soft pastel colours are a reminder of the coming spring even in the depths of January. Absolutely gorgeous. Because it's Helen Mirren, and after decades in the business she knows how to dress for a red carpet. The shape is really flattering on her, it's sparkly but without being overly bling, and she's showing the younger stars that you don't have to flash the flesh to look classy. Loving the mix of green tones going through the outfit too, from the dress to the bag to the earrings. I really like the 'fallen angel' vibe of this - the wing/feather motif that goes all the way down the dress on the black dress gives it a gothic feel, but keeping the rest of the outfit very toned down means it doesn't look too over-the-top. The one thing I'm not hugely keen on is her hair though; an updo would have made this look even better. Just utterly stunning. The shape of this dress is gorgeous - beautiful classic lines but with a little hint of sexiness from the plunge neckline. I love the gold detailing on the shoulders and hem as well, which add an opulent vibe and are then picked up in the bag and jewellery. Add simple hair and make-up and this is a red carpet look for the ages. 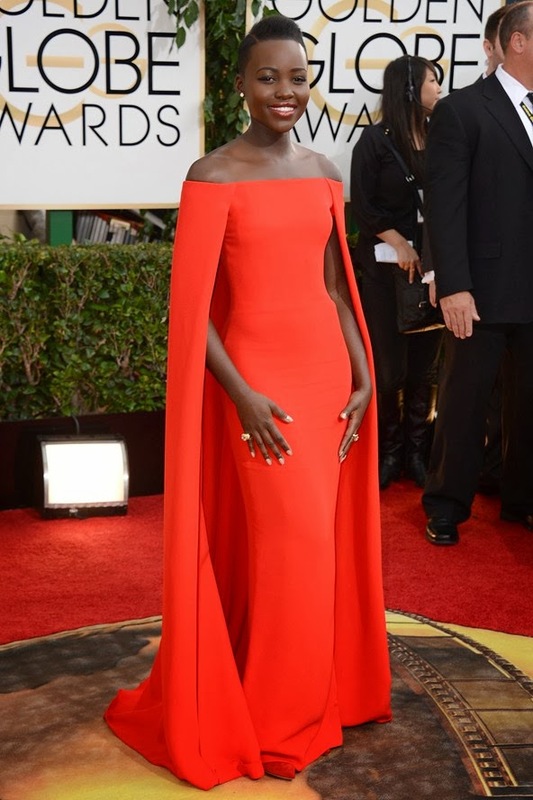 You've got to love a good cape on the red carpet, and Lupita Nyong'o knows how to rock one. The slightly orangey-red colour of the dress really suits her and the drama of the cape is complemented perfectly by keeping the rest of the look really simple. Just gorgeous. She's done it again! Michelle Dockery was one of my favourites at the Emmys all the way back in September, and her Golden Globes dress was just as lovely. Beautiful gold detailing, and a gorgeously simple gown that's offset by the slightly retro hair and bright but sheer lip. I'd love to replicate this look for my wedding. The first time I saw this I didn't like it, mainly because of the top which in some of the photos looks a little bit odd and disjointed. But the more I look at it, the more it grows on me; there's a 1920s garden party vibe about it which I really like, and I love the pretty floaty skirt and the classic hair and make-up. But what clinches it for me is the fact she looks like she's having the best time, which is something you very rarely see in red carpet pictures. Token bloke mention of the Golden Globes goes to Matthew McConaughey, for pulling off a green velvet tuxedo in a sea of boring black single-breasted suits. It could have gone a bit Willy Wonka but, on him, it works really well, and it was nice to see something different than the standard red-carpet looks. So there you have it - my picks from the Golden Globes red carpet. There were so many gorgeous dresses out there and it was lovely to see the various trends that are emerging ahead of the new fashion season and the coming awards ceremonies. Next up: the Baftas. Also don't forget to enter my 100 follower giveaway - you could win a Soap & Glory hatbox! 13 Things Before The End Of 2013: How Did I Do?